The Health And Safety Executive has brought four criminal charges against Foodles Production (UK) Ltd - a subsidiary of Disney. Foodles Production said it was "disappointed" by the HSE's decision. A spokesperson added: "By law, employers must take reasonable steps to protect workers - this is as true on a film set as a factory floor." Foodles Production is the company responsible for producing Star Wars VII: The Force Awakens, and as such is culpable under health and safety law. Representatives of the production company will appear at High Wycombe Magistrates Court on 12 May. A spokesman for Foodles Production said: "Cast and crew safety is always a top priority. We provided full co-operation during HSE's investigation into the on-set accident that occurred in June 2014 and are disappointed in HSE's decision." Star Wars: The Force Awakens was filmed at Pinewood Studios in Buckinghamshire. 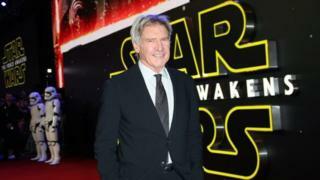 The eagerly anticipated movie is the most successful film ever at the UK box office and has taken more than $2bn worldwide. Production of Star Wars: Episode VIII has already got under way at Pinewood, and is due for release in December 2017.